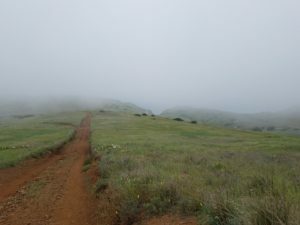 From April 21st to the 23rd, I camped on Santa Cruz Island, the largest of the Channel Islands and in fact, the largest island off the coast of California. The Nature Conservancy owns and manages the western 76% of the island, while the eastern 24% is owned and managed by the National Park Service. I had previously been there three times before but never for camping and was excited to see what this Sierra Club trip might offer. When I arrived at the Island Packers dock at Ventura Harbor at 7 a.m. on Saturday, I was greeted by 10 other Sierra Club campers. Several of us quickly formed a bond on the boat ride over as we watched dolphins playing in the wake of our boat. After about 1.5 hours, we pulled in to the dock at Scorpion Bay and began to unload. 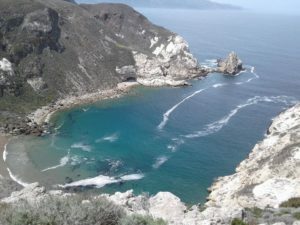 Santa Cruz Island, formerly the home of ten Chumash villages with over 1,200, was named “Limuw” or “in the sea.” The Chumash people occupied this island for over ten thousand years until 1769 when the Spanish missionaries began converting the island people. In 1822, the last known Chumash occupant left the island for Ventura where many were forced to work and live at the Mission. Later, the island was known for sheep and cattle ranching, a hunting club, fruit and nut orchards, and for smuggling illicit contraband. 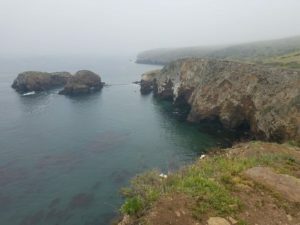 Santa Cruz Island is the most diverse of the eight Channel Islands with grasslands, coastal scrub vegetation, oak woodlands, and 77 miles of sea caves and coastline inhabited by giant kelp forests. This, alone, makes it a natural attraction for kayakers, snorkeling, bird watching, diving and many other activities. After disembarking our shuttle boat, we set up camp at a group campsite about a mile from the dock, making our tents as comfortable as possible in a grove shaded by Eucalyptus trees. The first hike I took was to Potato Harbor, which is one of my favorite vantage points on the island. 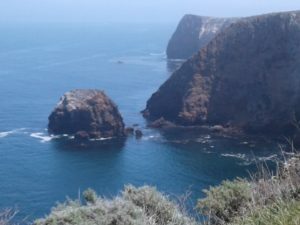 Here, at the top of the cliffs, you can look down several hundred feet to the sea caves below and, depending on the cloud action, view a bright green or deep blue sea. The name “Potato Harbor” comes from the oval shape of this scenic harbor. 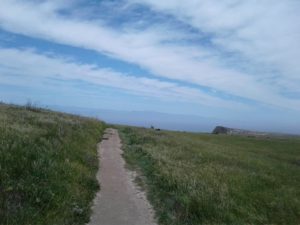 The trail along the top of the island is flat and easy to hike but the climb up is steep from either the campground or from Scorpion Canyon. After this refreshing hike, we had an hour or two to rest before it was time for Happy Hour – and what a smorgasbord we had! There were close to 40 people in our group and each had brought an item to add to the communal salad. We had hors d’hoeuvres galore and no one went hungry. After our meal, we sat in a circle and each introduced ourselves, talking about what we did for a living and our reasons for coming on this trip. This was a great way to get introduced to the others, most of whom had arrived on Friday and were staying until Monday. Following that, we had an interesting presentation from one of the original kayak instructors, who told us stories about his work, going back several decades. He was briefly interrupted, during his talk, by a group of middle-aged people, camping at the next campsite, who were all dressed up in “onesie’s.” If you don’t know what that is, it’s basically pajamas that zip up, but in this case, many of the outfits also had tails sewn into their rear-ends! The group were celebrating several birthdays and from the looks of it, they were already pretty intoxicated when they formed a conga line and danced through our campsite in their wild outfits! Fortunately, they had the good sense to take their party to the beach at around 9:30 p.m. so we all go some well – needed sleep! The following day, we had the option of climbing the 2,450’ Devils Peak, the highest mountain on the island with about 1,800’ elevation gain. I started the hike with the others but decided, early on, to rest and enjoy my time on the island by taking an optional side hike. After a short nap in a dry river bed with a killer view of the mountain range, I hiked back up to Potato Harbor to gaze, once more, upon that view. Sunday night, we all assembled for Happy Hour again, after which, we took a short hike to try to see the native bat species when they flew out of their caves into the night sky. We waited, and waited, and it started to get colder, most people headed back to camp. I decided to hang in there with one other lady, holding my flashlight up to the sky to create a beam of light. Just as I was about to turn in, a bat swooped down by my head to snap up its insect prey. It startled me, but I was glad I got to experience that. (One of my other friends, who was walking back to camp, actually did see five or six bats fly out into the night). All in all, it was very exciting! The descent to the Cove was pretty steep and I wondered as I walked down, how I was going to feel climbing back up it. Well it was well worth it – it was such a beautiful beach and quite a dazzling vantage point in every direction. Climbing back up the hill reminded me of the Hobbit story with its rolling green hills and the light brown-red dirt on the paths. It looked like a fairytale to me. The hike was just short of eight mikes, roundtrip, but the views from the top, coming back to Scorpion Bay were sensational. It was rejuvenating to see everything from the top of the island. This was a hike that I would like to do again. After a leisurely lunch, we all lined up by the dock to return to the mainland. After loading the equipment on board, we enjoyed our ride back to shore to go back to our individual lives. Saying goodbye was hard to do because of the great friendships that were formed over these three days together. But as we said our goodbyes, we agreed to stay in touch and try to get together again for another camping trip. I hope that happens because you can’t find this kind of an experience anywhere else. I can’t wait to sign up for my next adventure! Pat Kramer is a ghostwriter and a business marketing and PR writer. 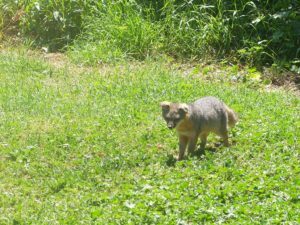 She is also a longtime member of the Crescenta Valley Group of the Angeles Chapter of the Sierra Club and serves on its management committee. You can read her work at: www.writerpatkramer.com or email: pat@writerpatkramer.com.